With Raimond Moooi Puts designer lighting, you’ll find poetry coming to life. There’s a powerful lamp surrounded by several twinkling lights, which gives the effect of a starry night. If you want to escape to a lake and lay there in the night, you don’t have to go too far. 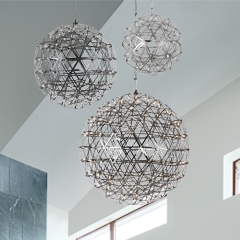 Our Replica Raimond Puts designer lighting collection lets you have starry nights right here in your living area. Small twinkling LEDs also give the look of firecrackers, so it’s always a celebration with these lights. Plus, you’ll find them at affordable rates here. Find the true beauty of Replica Raimond Moooi Puts designer lighting fixtures at low prices at Mica Lighting. Our Price: $620.00 GST incl. Our Price: $720.00 GST incl. Our Price: $1,140.00 GST incl. Our Price: $1,375.00 GST incl. Our Price: $2,300.00 GST incl. Our Price: $2,500.00 GST incl. Our Price: $2,750.00 GST incl. Our Price: $5,900.00 GST incl. Our Price: $6,300.00 GST incl. Our Price: $6,500.00 GST incl. Our Price: $7,600.00 GST incl. Our Price: $8,100.00 GST incl. Our Price: $8,300.00 GST incl. Our Price: $9,600.00 GST incl. Our Price: $10,300.00 GST incl. Our Price: $10,500.00 GST incl. Our Price: $12,000.00 GST incl. Our Price: $12,800.00 GST incl. Our Price: $13,300.00 GST incl. Our Price: $960.00 GST incl. Our Price: $850.00 GST incl. Our Price: $1,030.00 GST incl.